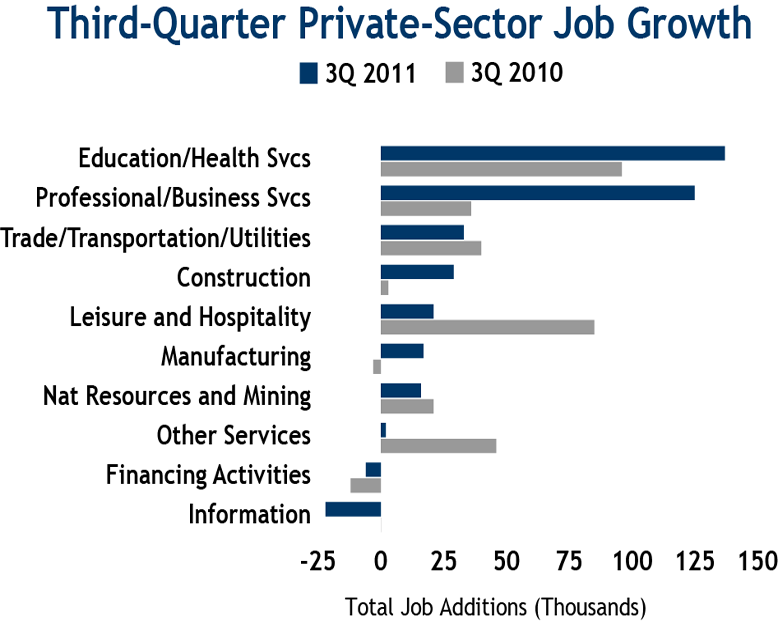 An uptick in hiring by private-sector employers in September yielded better-than-expected job growth in September. The positive results for the month, combined with upward revisions to July and August, confirm a trend of steady, though modest hiring that partially mitigates the potential for a new recession. Still, downside risks remain. The Eurozone debt crisis remains unresolved, while threats to the solvency of European banks and intransigence on Capitol Hill continue to loom as factors that may adversely affect near-term economic prospects. The addition of 137,000 private-sector jobs last month offset the elimination of 34,000 government positions, resulting in a net gain of 103,000 jobs. Results for July and August were revised to a gain of 184,000 positions, more than twice the number previously reported. Professional and business services employers added staff at a tempered pace, hiring an additional 48,000 workers in September, while the end of a strike by Verizon workers contributed to a gain of 34,000 information positions. 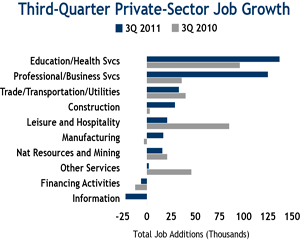 Overall, six of 10 private-employment sectors created jobs last month, while manufacturing, financial activities, leisure and hospitality, and other services cut a combined 28,000 positions. Planned layoffs by Bank of America will contribute to additional financial activities job cuts in the months ahead. The September employment report comes out amid a period of intensifying debate over President Obama’s $447-billion jobs bill. The proposed legislation, which features an expansion of payroll tax cuts, new public works spending and aid to reduce teacher layoffs, is scheduled for a vote in the Senate next week. Some independent economists suggest that the bill could create up to 200,000 new jobs per month next year and warn that, without the legislation, the probability of a new recession increases. Fueled by hiring in the professional and business services sector, full-time, office-using employment increased by 54,600 jobs in September. Approximately 250,000 full-time office positions have been added year to date, contributing to a 20-basis-point decline in the national vacancy rate to 17.4 percent in the third quarter. An additional 6.2 million square feet of office space was occupied in the third quarter, but prospects for more robust demand remain mixed. Trends in financial activities and information employment remain weak, while continuing cuts in government employment may result in reduced space requirements for government agencies. Job creation, along with lingering uncertainty in the for-sale housing market, continues to sustain strong performance in the national apartment sector. Nationwide, the vacancy rate slipped 30 basis points in the third quarter to 5.6 percent, 10 basis points less than was recorded at the start of the recession. Following net absorption of roughly 36,000 units in the third quarter, an additional 118,000 rentals were occupied in the first nine months of 2011. Overall, demand growth has enabled property owners to make steady progress raising rents and easing concessions. Asking and effective rents rose 0.6 percent and 0.7 percent, respectively, in the third quarter, pushing down concessions slightly to 7 percent of asking rents. This entry was written by marcusmillichap, posted on October 8, 2011 at 12:47 am, filed under Uncategorized and tagged Commercial Real Estate, Employment, research. Bookmark the permalink. Follow any comments here with the RSS feed for this post. Trackbacks are closed, but you can post a comment.